It all started a few months ago when Clark had an epiphany about Maggie: “She’s a 4-H girl!” he exclaimed. It’s so true. How had we not seen it before? There isn’t an animal she doesn’t love, and she throws herself into every craft project we try. Growing up in the Midwest, 4-H was everywhere. Here in Anchorage, it’s a little more complicated, so Clark decided to improvise. He has a co-worker who leases a horse. She isn’t the owner, but she is the primary caretaker. She agreed to let Maggie help her a few days a week, and Clark thought this would make a phenomenal (albeit complicated) Christmas gift. It was, without a doubt, the best gift of Christmas. What started as a trial arrangement has turned into something pretty special. Every Tuesday, Clark and Maggie head to the barn to work with Rosie. 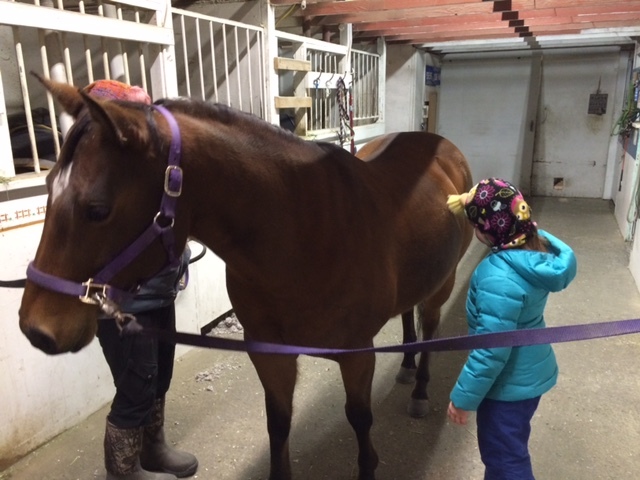 Maggie happily mixes Rosie’s mash, shovels her stable, brushes her, picks her hooves, and gives her love. She never complains about the smell or the cold, and seems to genuinely enjoy the work. She already knows all the horses, but of course she loves Rosie best. She’s learning so many valuable lessons, and always comes home beaming after her Tuesdays with Rosie. 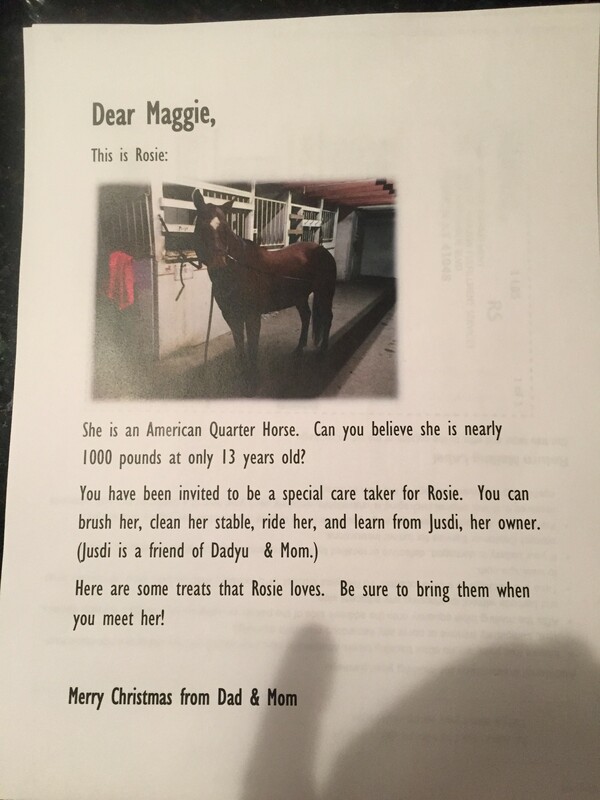 Some day Maggie will look back and realize this gift was about so much more than a horse. I’m confident her best memories will be of the special time spent with her dad, a man who honored her love of animals and believed in her dreams of becoming a vet so much that he found a way to set her on that path. He’s a great dad, and she’s one lucky little girl. Previous Previous post: Bee Resilient!